Keep up to date on the latest events, people, popular places and offers right now near you. Keep up to date on the latest events, people, popular’s places and offers right now near you. aMe around Me show you what is going on around you at this moment. - What is now happening around you and who's there? - Who is around you right now and what are they doing? - Where are the popular places now? - When the party begins and what deals are there? Our algorithm automatically will show who is around you and might be interested in connect, based on distance, time, similarities, common places and other metrics. Our efficient design and smooth user interface allows navigate through activities, people and places in seconds. Get the most interesting and hot spots in real time events. Meet new people around you at this moment. Discover what is going on around. Know every moment what is happening around you. Share and find images, locations, deals, real places. Share awesome moments with your beloved ones in awesome places. Tourists, neighbors, friends and complete strangers with common hobbies and preferences. Connect with people in real time and know what they are doing. Find the hotspots right now around your actual location. Security and privacy in connection with others, messages are deleted at the time you choose. Let everyone know what are you doing here right now, and no one will know tomorrow if you want, we will remove your post after 24 hours. please let us know what do you think too. 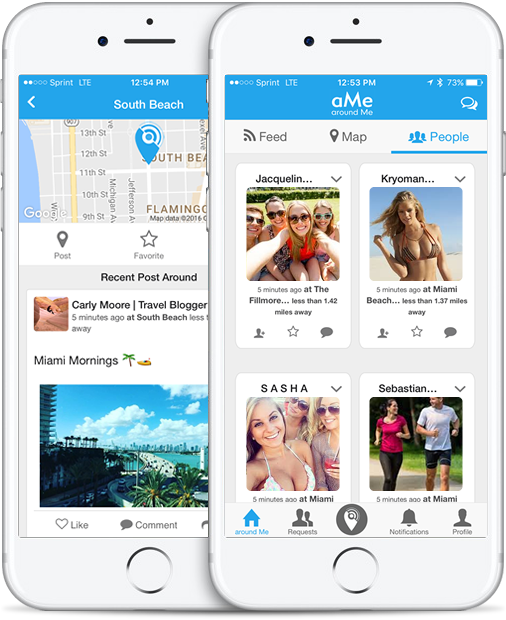 "I am very impressed with aMe. I'm using the application every day, connecting with new people who share my passion with sports." "I found this application through a friend, and it was wonderful to see so many people connected everywhere I go, sharing their activities and publishing their photos here." "It's amazing how Around Me shows you so many things, you can use it for business, to meet people in a bar, to find dates or to go to a sporting event, a word, amazing, thank you." "I start using this app to find evening parties on the beach, now I use it to everything, restaurants, concerts, looking people in the College, I can always find new friends with my same interest right there at this time."